We've yet to see a review sample of the coveted Zeiss Batis 135mm f/2.8, but our colleague Akiomi Kuroda in Japan has, and he's now unveiled his first batch of portrait images for Imaging Resource readers. Pairing the lens with the 42.4mp Sony A7R Mark II, Akiomi's images showcase the best that the Batis 135mm f/2.8 has to offer for sheer image quality, and we're thrilled to display this early look at real world portrait images from this venerable combination. The $2000 Batis 135mm f/2.8 lens from the Zeiss engineers is reported to be "...specially designed for mirrorless, full-frame cameras from Sony..." and they assure that the output will yield "an extremely realistic portrayal of your subject." Chromatic aberration is reported to be virtually nonexistent in the lens, and the team promises that the end results will be "images that amaze you." Did the Zeiss team succeed? Let Akiomi's excellent portrait images assist you in your quest to find out more! A big IR "Thank You!" to Akiomi Kuroda for sharing these excellent images with us! To view more from Akiomi please visit his website. 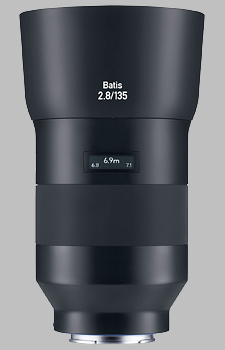 And stay tuned for a full laboratory test of the Zeiss Batis 135mm f/2.8 once we receive our lab sample. In the meantime you can view even more images from Akiomi with this combination in our Zeiss 135mm f/2.8 Batis Gallery Page. The advanced correction of the Apo Sonnar lens design ensures extremely realistic portrayal of your subject. To avoid shaking, an optical image stabilizer has also been integrated in the design. The fast and precise autofocus is your guarantee of sharply defined images -- even in difficult light. The shallow depth of field at maximum aperture allows the creative combination of focus and blur, allowing you to direct the viewer's attention to the main subject of your photo. The ZEISS Batis autofocus lenses were specially developed for mirrorless, full-frame system cameras from Sony. The lenses are fully compatible with all E-mount cameras and offer protection against dust and weather in addition to fast and quiet autofocus. For creative photography, the innovative OLED display shows the distance and depth of field to ensure that the focusing range can always be perfectly set. The result: images that will amaze you. The completely new design of the high-speed ZEISS Batis family offers perfect image quality. For the first time, you can accurately read the focus distance and depth of field simply and intuitively on the OLED display on the lens. Especially in poor light conditions -- excellent readability is always guaranteed. The Zeiss 135mm f/2.8 Batis 2.8/135 doesn't have any user reviews yet!